If you're looking for a pretzel recipe that will make you soft and chewy pretzels just like Auntie Anne's, I think you would love this one. 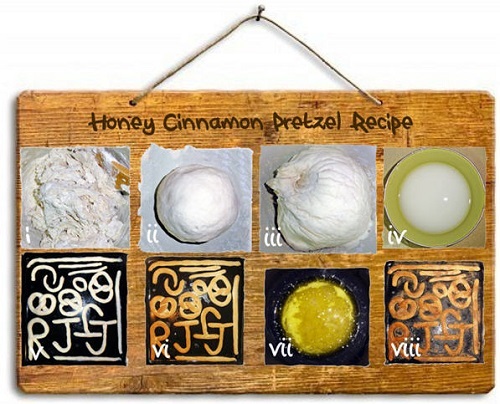 I always find soft pretzels with honey and cinnamon irresistible, so I started experimenting with different recipes and substituting all the table sugar with honey before finalizing with the following. Have fun and enjoy! i. Dissolve 1 teaspoon of dry yeast, 2 tablespoons of cream honey, and a pinch of sea salt in 1 cup of warm water. Add 1.5 cups of plain flour and 1 cup of bread flour. ii. Knead until smooth and elastic. (This is a critical step to achieve that soft and chewy texture for the pretzels.) Let it rise for 45 minutes. iii. 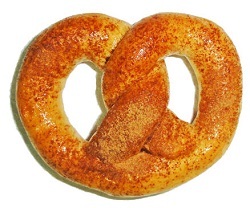 After dough has risen and doubled its size, pinch off bits of dough and roll into a long rope (about 1 cm thin or even thinner) and shape as desired (e.g different alphabets, Auntie Anne's logo). Let the pretzels rise for about half an hour. Roll and make really thin rope so that the pretzels do not become too thick after rising. iv. Make a soda bath by mixing 2 cups of warm water with 2 tablespoons of baking soda. v. Stir the soda solution well before dipping the pretzels into it. Place the pretzels on a well-greased baking tray. vi. Bake in a 220 degree Celsius preheated oven for about 10 minutes until golden brown. vii. Make a honey butter mixture by blending 4 tablespoons of melted butter with 2 tablespoons of honey. 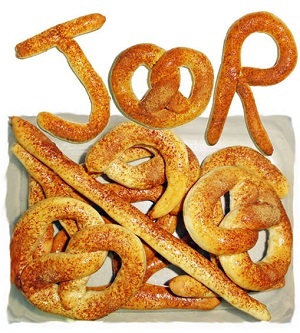 End of "Soft Chewy Pretzel Recipe" . Back to "Delicious Honey Recipes"